I have a confession to make: when it comes to shopping, I like it a lot more than my wife does. I also really like going to stores and buying stuff…even though with Amazon I can get most things the same day if I order them before 11am. But there’s something about going to a store or a mall, picking out the thing you want, and walking out with it. It bums me out that retail is dying. The news that Toys ‘R’ Us is closing kills me. That store is probably the reason I like shopping so much. But over the last few months, my shopping excursions have been fruitless, and the reason makes it very clear why retail is dying. I reconciled a long time ago that I could get books online much cheaper, at no extra cost. Amazon will often sell books for a fraction of the price as a book store, and those are becoming few and far between. If the price is close, I will still opt to buy it from the store and support the cause, but if I’m trying to save money, it simply doesn’t make sense. But it’s not just books any more. And it’s not just price. Over the last week I’ve gone to several shopping centers. My wife and I wanted to have a Treat Yo’ Self Day last weekend…one last hurrah before we really buckle down and save every extra penny we have for a house. We set a reasonable budget and went to a very big (upscale) mall near us. Every store I went to didn’t have what I was looking for in stock. My wife, who wanted shoes, didn’t find what she was looking for at a reasonable price. We walked out pretty much empty-handed, except for some shaving supplies I got. In the middle of the week I went to an Apple retailer and Walmart to pick up some things. I was successful at the retailer…I settled on an in-store model for a new computer after I got the resale price I wanted for my Macbook Pro. Walmart was a fruitless endeavor for some simple home network supplies. I went to Best Buy, where I paid a lot more than I would have on Amazon, but needed them that day (and it was after 11am). Apple is a prime example of this. They carry enough stuff to try before you buy, but I’ve been encouraged more than once, in-store, to just use their website. At Walmart and most of the stores we went to at the mall, we got the same line: “We could order it online for you.” I appreciate the help, but I’m here because I chose to not order it online. Lots of stores can’t carry the stock of their online counterpart, which has huge warehouses at their disposals to ship stuff from. And as a consumer, my expectation has always been that I can get what I need in a store. The problem is I don’t need to run all over town anymore, given that I have 12 hours notice on what I need….Sundays included. 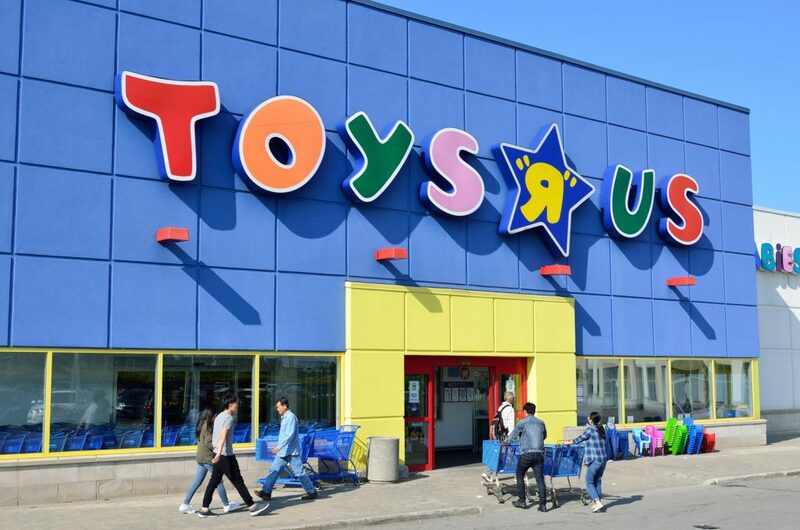 Unfortunately Toys ‘R’ Us is going out of business because it fell into the same trap as JCPenney, Sears, and many others: it failed to adapt. I noticed another thing about malls this week. They are changing. At the mall we went to, Peloton has a store. Casper has a store. These are places to try before you buy. They both offer a 30 day free-return policy so having showrooms make sense. Tesla, Apple, and Microsoft are basically playgrounds to see expensive tech, in the flesh. Apple Stores have workshops. Microsoft’s store looks like a convention floor — booths to try VR, various Surface devices, Xbox, and more. My hometown mall has a Round One, which is a huge arcade and bowling alley. It’s getting a Gold’s Gym. The only long-standing stores have been the arcade and the movie theater. Places for people to do stuff. Malls are becoming a place to hang out (beyond what bored teens do). They are becoming a place to try and test and feel good about online purchases. Soon, I suspect stores won’t carry any stock, but you can try something, and have it at your house same-or-next-day. Furniture stores do this already. Pick something on the showroom floor then have it delivered. Could Toys ‘R’ Us Have Been Saved? I think so, if they adapted. If they evolved from a place to buy toys to a place to play with toys. They already had a video games section. Why not make a mini arcade where kids could pick a game and console, play it, and then buy it? Why not make a playground for children to climb on things and play with lego and big box items? As a parent of a 1 year old, that would make the decisions my wife and I make a lot easier. We’d have toys we know our daughter likes. Honestly, it’s a bad time to be a retail store. The Retail Apocalypse is happening and it ain’t pretty. The ones that survive will be the ones that are more than just a place to buy things. And honestly, those will be brands (or Amazon). What I would love to see is the old buildings get knocked down and more green space to spend time outside. It’s probably unlikely…but a guy can dream, right? Hey Joe! Love your post. I agree there are a lot of weaknesses with brick & mortar retail. But I wish we (as an industry) talked about the advantages a little more. You hinted at it with your comment about an arcade in the store. Brick & mortar stores can provide a unique experience in the store that can’t be replicated by Amazon. If you just want to sell stuff you may be out of luck. Hey Patrick! I totally agree with your point about experiences. I see and hear that a lot more from people around our age. And as you point out, Apple kills it in that regard. At last year’s WWDC they talked about turning Apple Stores into “Town Squares,” where there will be more support, classes, and events. While the name is a little snobby for my taste, the idea is 100% dead-on. It’s why they continue to survive, even when they tell people that ordering online might be a better bet for them.